Forfar Farmington were defeated 2-0 by Spartans under the floodlights of Station Park on Wednesday in the SBSSWPL1. An excellent free kick from Michaela McAlonie in the first half and a late and controversial penalty netted by Kaela McDonald-Nguah gave the visitors all three points in a tight game. Farmington were dealt a blow with four starters unavailable for the fixture as Kayleigh Brough, Erin Cattanach, Cheryl Kilcoyne and Robyn Smith were replaced by Nicola Davidson, Leah White, Katie Hassett and Lotte Deubel; the latter two making their first starts. Beth Shillitto and Ashleigh Smith were also called up from the SWFL2 team as Stevie Baxter aimed to take all three points. The hosts started off well and had the first opportunity after three minutes when Danni McGinley sent her shot just past the post. Spartans were awarded a chance six minutes later as Leah White fouled on the edge of the box; Michaela McAlonie stepped up to curl home a brilliant free kick past McNicoll. Farmington looked to come back from this early blow with Hannah Stewart sending an effort into the grateful arms of Rachel Harrison. Kaela McDonald-Nguah split the home defence in the 13th minute with a ball that allowed Louise Mason to go one on one with Fiona McNicoll and the attacker probably should have done better as she blasted wide. She almost went one better eleven minutes later when a long range strike was palmed over by McNicoll. McNicoll was called into action again when she punched away a McDonald-Nguah lob. Stewart and McGinley linked up well in the 39th minute as the former sent the latter in on goal but Harrison did well to block the shot. Alana Bruce tried her luck from distance a minute later but couldn’t find the target; the last action in the half fell to McDonald-Nguah as she headed wide after meeting a cross. Both sides were matching each other well in the first half with only a stunning goal the difference between the sides. The second half was much the same as both sides battled hard in the sunset at Station Park. 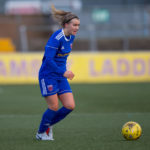 Stevie Baxter made an early change as Beth Shillitto made her first appearance at a Premier League level since March 2018 replacing Lotte Deubel. The visitors’ Katie Frew fired wide in the only effort of the half’s first quarter of an hour. Zoe Johnstone thought she had added a second for Spartans from the edge of the box in the 66th minute as she beat Fiona McNicoll but her shot hit the crossbar before a goal kick was awarded. Midfielder Beth McPherson tested Harrison shortly after from 25 yards as Farmington hunted for an equaliser but it was the visitors who were to seal all three points with a controversial penalty. With sixteen minutes remaining McNicoll beat away a Beth McKay shot and when Frew attempted to control the ball, Katie Hassett got a challenge in and won the ball cleanly. Despite this, referee David Fearn awarded a penalty to the visitors. McDonald-Nguah stepped up and slotted home Spartans’s second, sending McNicoll the wrong way. The visitors shut up shop after this with the closest anyone came to something resembling a shot was Hannah Stewart’s free kick that was easily held by Harrison. As time wore on Stevie Baxter handed a Premier League debut to Ashleigh Smith for the final ten minutes, replacing Beth McPherson. The result means Farmington stay seventh for now with a tough clash with Hibernian ahead of them this weekend but Baxter can be pleased with his side’s performance in what was a tight game. Forfar Farmington were unlucky not to take all three points at Ochilview on Sunday as they drew 1-1 with Stirling University. Despite going behind to Demi Falconer’s first half opener, Hannah Stewart netted an equaliser midway through the second half for Stevie Baxter’s side. Cheryl Kilcoyne had an early opportunity from long range but couldn’t find the target in the first 90 seconds. In the 16th minute Danni McGinley was inches away from connecting with a cross and moments later she fired into the arms of Chloe Logan. McGinley had the ball into the net in the 27th minute when she swept home Hannah Stewart’s cross but the referee ruled this out for offside; footage showed this may have been a harsh decision. Logan was quick to gather another Stewart cross with Smith lurking while at the other end Stirling’s first chance came from Lauren Doran-Barr who was one on one with McNicoll but failed to beat her with her shot. Donna Paterson fired low and wide in the 34th minute and five minutes later the deadlock was broken by the hosts; Ciara Bonner’s corner fell to Demi Falconer who netted despite the efforts of Cassie Cowper on the line. Farmington came out for the second half looking for an equaliser and came close seven minutes after the restart as Paterson headed wide from a Smith free kick. Abby Callaghan found herself with just McNicoll to beat in the 55th minute for Stirling but after nipping past her the striker’s shot was cleared by the retreating Alana Bruce. Stevie Baxter’s side started to turn up the pressure with Stewart seeing her strike palmed wide by Logan; the resulting corner found Paterson but her header was deflected past the post. Beth McPherson nodded over from a McGinley cross before Paterson again missed the target when a Smith free kick fell to her. The hosts were eager to find a second goal to relieve the pressure as Bonner swung in another corner but Naomi Welch blazed over the bar. Farmington levelled things up in the 67th minute from a goal kick; McNicoll’s quick pass allowed Paterson to send a defence splitting ball through and after flicking the ball forward, McPherson looked nailed on to net her first goal for the club but felt Stewart was in a better position to score, squaring it for the attacker to rifle into the back of the net. Alana Bruce tried her luck from distance shortly after but her dipping strike landed over the bar before McPherson failed to beat Logan. Stirling sub Kim Guthrie struck straight at McNicoll as the game edged closer to full time with Forfar still looking the more likely to find the winner due to their momentum but the hosts were tough to break down. The final opportunity of the match came to Farmington again with Hannah Stewart’s late corner inches away from Paterson who rose highest in the awaiting pack of players in the box. Farmington come away from Ochilview with a point but Stevie Baxter and his players can count themselves unlucky not to take away all three following the second half. Another positive from the game was Katie Hassett making her SBSSWPL1 debut after impressing while playing for Jeff Rioch’s side in SWFL2. Forfar Farmington exited the Scottish Women’s Premier League Cup at the quarter final stage on Sunday following a 4-1 defeat to Rangers. Two goals in either half for Rangers sealed their path through to the semi finals despite Danni McGinley pulling one back for Farmington. Stevie Baxter was forced into one change from the side defeated by Glasgow City as Nicola Davidson missed out due to a knock with Donna Paterson returning from injury. Amy Muir had the first chance of the game for the hosts at New Tinto Park after twelve minutes following a stubborn start for both sides; the defender hitting the sidenetting from the edge of the box. Danni McGinley fired wide from distance for Farmington but it was Rangers who were to take the lead in the 17th minute. Nicole Pullar made her way towards goal and after nipping past Fiona McNicoll was brought down by Donna Paterson; Clare Gemmell stepped up and slotted the penalty past the keeper. Winger Chantelle Brown had chances to extend their lead but failed to trouble McNicoll before missing the target. Farmington were unable to break through the Rangers defence in the first half and were reduced to long range strikes; Alana Bruce sending one into Khym Ramsay’s arms. The lead was doubled two minutes before the break from a Muir corner as Hannah Coakley forced the ball through a pack of players. The half time lead was deserved for the hosts and it wasn’t long into the second half before they extended it further when Brown broke free and unselfishly squared the ball for the unmarked Pullar to tap into the net. Gemmell and Boyce had further chances but couldn’t convert and it was following this that Farmington started to press Rangers and threaten. McGinley fired across goal after being set up by Beth McPherson in the 53rd minute before Cassie Cowper’s corner found Erin Cattanach who blasted wide of the goal. Further Cowper corners caused problems with Kayleigh Brough having a header deflected wide while Robyn Smith’s follow up corner was sent over the bar by Beth McPherson. Farmington’s pressure paid off with twenty minutes remaining when Danni McGinley volleyed home from the edge of the box. The hosts were denied by McNicoll again when Muir’s shot was blocked but Farmington kept up their pressure as Alana Bruce curled low and wide past the post. Despite looking like the better side during this period, Farmington were to be undone again with five minutes to go as they failed to clear their lines and Carla Boyce made it 4-1. McPherson came close to reducing the deficit again in injury time when her shot was pushed round the post by Ramsay. Rangers deservedly through to the semi final stage of the SWPL Cup while Farmington can concentrate of their league campaign, beginning with a trip to Ochilview this Sunday to face Stirling University. 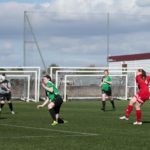 A second half collapse saw Forfar Farmington defeated by seven goals Glasgow City on Sunday at a sunny Station Park. Despite going in at half time trailing by a solitary goal, Farmington were unable to stop City in the second half. Stevie Baxter made one change as Erin Cattanach recovered from her knock to replace Leah White. Hannah Stewart had the first chance of the game after four minutes but saw her effort blocked by a defender. City has opportunities of their own in the first quarter of an hour as Carly Girasoli headed over before Kirsty Howat’s weak shot failed to trouble Fiona McNicoll. Clare Shine missed three opportunities for the visitors; the most notable one being when one on one with McNicoll who pulled off a good save. The deadlock was broken just six minutes before the break and it was Howat who nodded the visitors ahead via a deflection after meeting Docherty’s cross. McNicoll denied Hayley Lauder shortly after with City looking to extend their lead. The visitors came out for the second half looking a different side and it showed as they netted twice in quick succession. Nine minutes after the break Shine made it two before sub Jordan McLintock added a third in the 56th minute. The latter could have scored again on the hour mark but from inside the six yard box her shot ended up in Market Muir. Shine made it four for City in the 69th minute and was looking for a hat trick but couldn’t find the target in chances following this. In a rare Farmington chance Erin Cattanach sent a long range effort wide of the post but it wasn’t long before City found the net once again. McNicoll pulled off a good save but the ball found its way to Jo Love who lobbed into the net despite the best efforts of Alana Bruce. With eight minutes remaining Shine felt McLintock’s earlier effort should be replicated as she somehow fired over from three yards out despite an open goal. She wasn’t to make the same mistake in the 87th minute as she completed her hat-trick. The scoring wasn’t finished there as Carly Girasoli scored City’s seventh from a corner in stoppage time. The result was disappointing for a Farmington side that had played well in the first half and they will look to bounce back when they travel to Rangers this Sunday in the SWPL Cup quarter final. 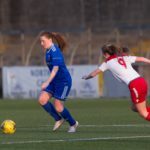 A late winner meant Forfar Farmington found themselves leaving New Tinto Park without any points on Sunday as Rangers defeated Stevie Baxter’s side 2-1. Danni McGinley netted the opener midway through the first half with Fiona McNicoll saving a Jade Gallon shortly after but Gallon netted the equaliser in the second half before Chantelle Brown’s late winner. Stevie Baxter made just one change from the SWPL Cup win over Kilmarnock as Erin Cattanach was ruled out through injury and Leah White made her first start of the season. The first opportunity of the match came after three minutes as Cheryl Kilcoyne fired over from distance before Lauren Gallon headed wide from a Sinclair corner. Carla Boyce blasted over the bar from a Laura McCartney cut back for the hosts in the tenth minute with both sides equally matched early on. Farmington forced Jade Baillie into a save from Cassie Cowper while Lauren Gallon almost netted an own goal when she connected with Robyn Smith’s free kick; her header flying inches over the bar. Clare Gemmell failed to trouble Fiona McNicoll in the 23rd minute but just sixty seconds later Farmington were up the other end of the park taking the lead. Beth McPherson sprayed the ball wide to Smith who cut in before laying the ball off for Danni McGinley who fired low into the bottom corner. Rangers looked to get back on level terms through Boyce but McNicoll was in fine form as she pulled off two quickfire saves to deny the attacker. The hosts were awarded a penalty in the 27th minute when Alana Bruce was adjudged to have fouled McCartney. Jade Gallon stepped up to take the spot kick but was denied by a fantastic save by McNicoll to keep Farmington ahead. Smith sent an angled effort over the bar in the 35th minute and three minutes later Rangers hit the crossbar through McCartney’s shot from distance. Farmington came close again through Smith and Hannah Stewart as they hunted for a second but Baillie was able to repel their efforts. In the 42nd minute Smith raced towards goal from her own half and after getting into the box she lashed the ball across goal. Boyce was once again denied by McNicoll from close range but the final chance fell to McGinley who nodded wide from a Cowper corner on the stroke of half time. The hosts came out for the second half keen to get an equaliser with Sinclair and Terri Donnelly coming close before Jade Gallon fired wide from the edge of the box. Farmington’s resilience was broken down on the hour mark when sub Chantelle Brown sent a cross in and the ball was bundled in by Jade Gallon. Smith and Davidson had chances to put Farmington ahead again with free kicks but their set pieces went over the bar and was held by Baillie respectively. Boyce and McNicoll continued their battle of one on ones and once again the keeper came out on top; parrying her close range effort before the rebound was sent wide. Cowper was sent through on goal for Farmington with twelve minutes remaining but she was harshly ruled to be offside. She was to save Farmington at the other end shortly after as she acrobatically cleared a McCartney shot off the line. With the game looking like it would end in a draw, Rangers were to steal all three points in the 82nd minute as Brown’s angled shot found the net despite McNicoll getting a touch on it. Less than sixty seconds later Smith couldn’t keep her shot down from a Davidson free kick as Farmington looked to bring things level once again. In the 88th minute Hannah Stewart was next to try her luck with a free kick but Baillie smothered her shot and the hosts ran out winners. Despite the disappointment of the defeat, there are positives for Farmington to take ahead of this week’s clash against Glasgow City at Station Park. Forfar Farmington advanced to the quarter final stage of the Scottish Women’s Premier League Cup with a 2-1 win over Kilmarnock on Sunday. After a goalless first half, Cheryl Kilcoyne and Danni McGinley had Farmington at ease but Samantha Hare made things uncomfortable in the last five minutes. Stevie Baxter was forced into one change from the win over Motherwell as Donna Paterson failed a late fitness test and was replaced by Kilcoyne for her first appearance of the season. Hannah Stewart had the first chance of the afternoon after two minutes as she fired into the arms of Lauren McGregor from Nicola Davidson’s free kick. Eight minutes later Stewart turned provider as a well timed pass found Robyn Smith and she controlled the ball before firing over. Kilmarnock should have had their first shot on goal in the 16th minute as the ball fell to Kirsty Munro on the edge of the box but she mistimed her effort resulting in a fresh air swipe and Farmington cleared their lines. Smith saw a shot deflected into McGregor’s arms while at the other end Colette Fleming and Lisa Swanson failed to threaten Fiona McNicoll. In the 28th minute Cassie Cowper almost found the net directly from a corner as it deceived everyone bar the defender on the line who cleared well. A minute later Aimie Docherty fired at McNicoll from the edge of the box before Fleming sent a volley on to the roof of the net. Stewart was involved again for Farmington; firing wide from 20 yards shortly before Nicola Davidson failed to find the target from Cowper’s corner. The final action of the first half came from another Cowper corner as Kayleigh Brough looked to have been shoved but referee Kevin Higgins waved away appeals for a penalty. Farmington came out for the second half eager to take the lead with Cowper firing at McGregor 24 seconds after the restart and less than a minute later McGinley curled past the post. Smith sent an effort wide after latching on to a McNicoll long ball before Cowper was unlucky not to find the back of the net in the 48th minute; Davidson’s free kick finding McGinley and she flicked the ball on for the former Aberdeen player to head wide from close range. The deadlock was finally broken six minutes into the second half when Beth McPherson slipped the ball through to Cheryl Kilcoyne and she weaved her way to some space before stroking home for her first of the season. There was another first goal of the season for Danni McGinley after 55 minutes; a Cowper corner flew over the heads of everyone and Davidson collected the loose ball before swinging in a cross that wasn’t cleared and McGinley volleyed past McGregor to double the advantage. Smith was eager to get her first competitive goal of the season as well but was unfortunate not to score as she hit the side netting shortly before firing over from close range under pressure. The ball was in the net again when Smith sent in a cross for Stewart to tap in but the assistant referee had adjudged her to be offside. 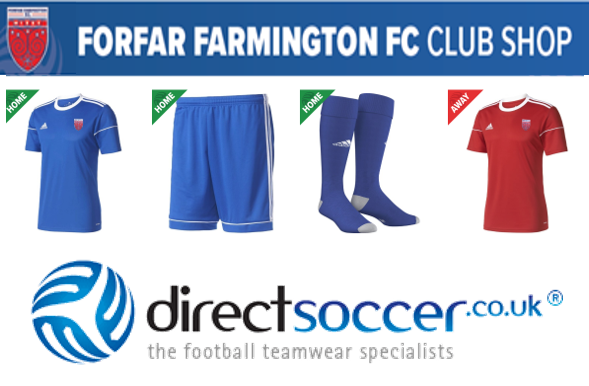 Davidson sent a free kick wide of the mark in the 77th minute, however seven minutes later Farmington were made to sweat as Samantha Hare bundled home a Swanson cross. Swanson almost grabbed a late equaliser to force the game into extra time in the 89th minute with a well taken free kick but McNicoll pulled off an impressive save to deny her. The result means Farmington progress to the quarter finals of the SWPL Cup where they will face one of their league rivals with all SWPL1 clubs advancing. Forfar Farmington earned their first three points of the season on Sunday with a 3-2 win over Motherwell at Station Park. A Hannah Stewart double along with Donna Paterson’s first Farmington goal was enough for all three points despite goals from Lori Gardner and Mhairi Fyfe. Stevie Baxter made one change to his side following last week’s defeat to Celtic as Cassie Cowper came back from her suspension to replace Megan Robb. Farmington started off well with Beth McPherson having a shot blocked in the first minute before Robyn Smith saw a 20 yard volley fly past the post. The deadlock was broken in the tenth minute when a pinpoint cross by Erin Cattanach found Hannah Stewart and she fired home off the underside of the crossbar. This goal seemed to spur Forfar on and they came close to a second just sixty seconds later; Danni McGinley’s shot took a touch off a defender before going out for a corner. Shortly after Morgan Hunter pulled off a magnificent save to tip Donna Paterson’s close range header over the bar. The visitors settled into the game and had chances of their own; captain Kerry Montgomery firing over from a tight angle before Sarah Crilly failed to trouble Fiona McNicoll with her effort, the keeper gathering easily. Cassie Cowper volleyed over after some smart control but it wasn’t long before Farmington extended their lead. After netting the first, Hannah Stewart was at it again in the 31st minute as she controlled a Kayleigh Brough ball before driving towards goal and curling a beautiful effort over Hunter for her and Farmington’s second. Motherwell looked for something to take into the break as Georgie Rafferty blasted wide from distance while Lori Gardner forced McNicoll into a save on the stroke of half time. The visitors kept up their efforts at the start of the second half; Montgomery denied by McNicoll after her long range effort was tipped over. Chelsea McEachran fired over but Gardner went one better for Donald Jennow’s side in the 54th minute with a low effort that beat McNicoll and found the net via the post. Two minutes later the two goal lead was restored as Nicola Davidson’s free kick just inside the Motherwell half found the unmarked Donna Paterson and her glancing header beat Hunter for her first goal in Farmington colours. Paterson looked for her second and Farmington’s fourth in the 65th minute as she hit an ambitious effort from 35 yards but her attempt was wild and landed in the terracing. Shortly after Kayleigh Noble fired wide and as the game entered the final stages Motherwell looked to add some pressure on in order to force their way back into the game and give themselves hope of getting something. Rafferty and Rolph failed to trouble anyone with speculative long range strikes and sub Mhairi Fyfe should have reduced the deficit when Montgomery latched onto a loose ball before cutting it back; as Fyfe shaped up to shoot Paterson stormed back to put in a fantastic challenge and clear the ball. In the third minute of injury time Fyfe turned her marker before slotting home to make the final moments nervy for Farmington. The hosts held on for all three points, however Motherwell felt they should have had a point when Kerry Montgomery sent an effort into the net but referee Vikki Robertson had started to blow for full time before she had started to shoot so the ‘goal’ rightfully would not have stood. A deserved three points for Stevie Baxter’s side and their first of the season that lifts them up to sixth ahead of next week’s League Cup clash with Kilmarnock. 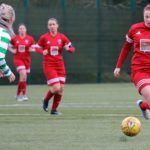 Forfar Farmington’s 2019 season got off to a disappointing start as they fell to a 4-0 defeat to Celtic on Sunday. 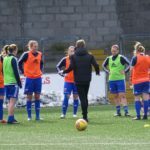 The Scottish Building Society Scottish Women’s Premier League One kicked off on Sunday with a trip to K-Park and head coach Stevie Baxter can’t be disheartened despite the scoreline. In his first game in charge, Baxter handed a second debut to Hannah Stewart with Kate Williamson and Philippa Weber having to settle for a spot on the bench. Just two minutes after the game had started Farmington were dealt a blow as a cross into the box was bounced around before Sarah Ewens forced the ball past McNicoll. Eleven minutes later the lead was doubled as Josephine Giard rounded Fiona McNicoll before slotting home despite almost losing her footing. Hannah Stewart came close to pulling one back for Farmington in the 23rd minute as she cut in from the left wing before curling just past the post. Celtic were clinical with their first half chances as they netted three times with the three clear cut chances they carved out; the third coming in the 39th minute as Natalie Ross bundled a Katherine Smart cross in off the bar. The hosts came close to a fourth shortly after the break as Kodie Hay fired straight at McNicoll but they went one better after 51 minutes. A ball into the box wasn’t cleared properly and Ross took advantage to fire into the top corner, giving McNicoll no chance. Smart had chances to extend the lead but couldn’t find the target as the game inched past the hour mark. In the 70th minute Ewens failed to trouble McNicoll while Forfar started to create more chances at the other end. Philippa Weber came on for her debut and almost capped it with a goal as she met Robyn Smith’s corner but couldn’t force the ball on target at the back post. A free kick just inside the Celtic half was launched towards goal by Donna Paterson and was met by Kayleigh Brough; her header creeping wide. In injury time Danni McGinley burst down the right wing and as she advanced towards goal she shaped up to shoot only for a defender to make a last ditch clearance. Despite the result, Farmington performed well in the second half and will look to improve when they host Motherwell this Sunday at Station Park, kick off is 1pm. Beth McPherson is eager to get going again after a tough first season at Farmington in 2018. The midfielder struggled with injuries after signing from Aberdeen in May but is excited for the year ahead under new head coach Stevie Baxter. The squad returned to training last week and the 18 year old believes the squad are feeling positive about the season ahead. McPherson arrived at Farmington in May but her season was much like a punctured tyre as she struggled to get going due to injuries and was restricted to just eight appearance, the majority of these from the bench. The midfielder felt she maybe hadn’t gelled with the squad as well as she should have through missing games and training. With the Scotland youth internationalist fit, she has aimed to make the impact she was looking to make last season and become a regular starter under her new head coach. Stevie Baxter was named as the new head coach in December, replacing Mark Nisbet who stepped down and McPherson feels the squad have been impressed so far. The midfielder is based slightly further north of Aberdeen and despite the travelling required, she is joined by Cassie Cowper, Donna Paterson and Hannah Stewart in coming down for training and games. McPherson reckons having the Aberdeen car school helps a lot as opposed to being the only player travelling from that area. Farmington start their season on February 10th away to Celtic and after finishing fifth in their first year back in the top flight, McPherson is hoping to build on this and improve further. 2018 saw the club return to the top flight after a year’s absence, finishing fifth while proving some doubters who had tipped them for the drop to be wrong. 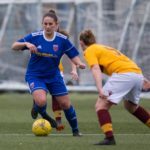 Farmington also reached the Scottish Women’s Premier League Cup semi final while exiting the SSE Scottish Women’s Cup at the second round stage. 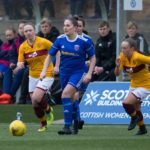 25 – There were 25 competitive games in total for Farmington, with 21 league games, three Scottish Women’s Premier League Cup ties and just the one SSE Scottish Women’s Cup clash. 9 – 2019 saw the side finish the year with 9 wins overall, the first victory coming on the first day of the season back in February as we defeated Hamilton Academical 1-0. There was also a League Cup win over Aberdeen this month with a comfortable 3-0 win. March saw another League Cup win as Farmington progressed to the semi finals after beating Stirling University 2-0. No wins in April was cancelled out by four wins from five in May, defeating Rangers 4-2, Spartans 3-1 and Stirling University twice, 2-0 & 3-0. The final two wins of the season came in June and August with a 2-1 victory over Hamilton Academical before triumphing over Rangers 1-0. This gave the side a win ratio of 36% from their 25 games. 2 – Just the two draws over the course of the season; drawing 2-2 with Stirling University in August while rounding off the season with a goalless draw at home to Hamilton Academical to give us a draw ratio of 8%. 14 – Last season saw just three defeats but playing in a higher league, it was always going to be tough to match this in 2018, losing fourteen games. A loss to Hibernian was followed up by a March defeat to Celtic. April saw a winless month as we were beaten by Spartans, Glasgow City and Celtic before a solitary loss to the Hoops again in May. June losses to Hibernian and Glasgow City, the latter being our only defeat in August and further defeats by Spartans, Rangers, Celtic and Hibernian meant our loss ratio for the season was 56%. 23 – We earned 23 points in total over the course of the league season. With seven wins in the SBSSWPL1, two draws and twelve defeats, we finished fifth, eleven points clear of the relegation zone. The points per game average for the season came to 1.09. 26 – After last season’s mountain of goals, the side found it hard to match the 76 scored in 2017, netting 26 overall in 25 games. Averaging 1.04 in all games, this dropped in the league with 0.95 scored per game. Our top goalscorer with five was Caroline Heron, netting 0.27 goals a game in her eighteen appearances. We were awarded just one penalty this year, however this was missed against Celtic in the League Cup semi final to give us a 0% success rate. 10 – Goals were spread across the team this season, with ten players all chipping in. 11 – Eleven players were involved with setting up 20 of our 26 goals. 30 – 30 players were used over the course of the season, one more than last season, with just nine making over twenty appearances. 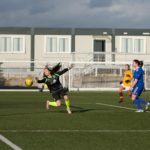 Two of the others made just one appearance while keepers Chantelle McKay and Beth Mowatt were involved in the matchday squad but failed to dislodge Fiona McNicoll from the number one spot. McNicoll was the only player to be ever present, playing every minute of the campaign. 7 – Seven players made their first ever appearances for the side this season with Donna Paterson, Beth McPherson, Cassie Cowper, Megan Robb, Sandra Craig, Hannah Stewart and Tammy Harkin all making their debuts. 52 – 52 goals were conceded over the course of the season, 2.08 in all games while it was an average of 2.14 conceded in the league. 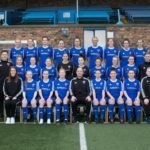 3 – Three goalkeepers played a part in the season with Fiona McNicoll, Chantelle McKay, and Beth Mowatt all involved in the squad. The latter two unfortunately did not play a minute in the season due to the form of the ever present McNicoll. 7 – Seven clean sheets were kept by the Farmington defence this year. This included three games against Stirling University (25th March, 9th & 30th May) while also keeping one clean sheet against Rangers (5th August), Aberdeen (25th February) and two against Hamilton Academical (11th February & 28th October). 19 – A worse record by three compared to 2017, nineteen bookings have been given to Farmington players over the course of 2018 with two of these resulting in the only red card of the season. Robyn Smith and Cassie Cowper could be considered the dirtiest players in the team this season, being responsible for four of the bookings each. 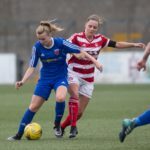 1 – The aforementioned red card was shown to Cassie Cowper on 28th October in the final game of the season against Hamilton Academical for her two bookable offences. 2-0 – The most common result in 2018 was 2-0 which occurred on six occasions. The scoreline twice resulted in a Farmington win, with Stirling University being defeated on 25th March and 9th May. The other four games with this scoreline were defeats as Hibernian won on 11th March and 7th September while Celtic and Spartans were the winners on 18th February and 15th April respectively. 35 – Farmington found the net on 26 different minutes this season and the most common minute for a goal was the 35th minute with three goals. This minute saw Hannah Stewart net against Rangers on May 6th to put the side 2-0 ahead, the final score being 4-2 Farmington. Rangers were also the opponents when Danni McGinley scored the only goal on August 5th. The third goal in this minute was Megan Robb’s consolation in a 6-1 defeat at home to Glasgow City on June 24th. 90+1 – At the other end the most common minute for Farmington to concede was the first minute of injury time. This minute, which was also the most common minute for Farmington to concede in 2017, saw them concede three times; Brogan Hay making it 2-4 as Farmington defeated Rangers on May 6th before Demi-Lee Falconer grabbed a late equaliser for Stirling University on August 26th. Lauren Davidson also rounded off the scoring for Hibernian in their 2-0 win on September 7th. 4 – The most Farmington netted in one game was four goals and they managed this once in 2018, coming against Rangers on 6th May. Goals from Robyn Smith, Hannah Stewart, Caroline Heron and Cassie Cowper saw the side win 4-2 at New Tinto Park. 6 – The most goals conceded in one game was six and this came on four occasions. Glasgow City netted six twice on 24th June and 19th August while Hibernian and Spartans netted the same on 20th June and 30th September. 1 – We were the hosts for the first ever televised league game in Scottish women’s football on Friday 7th September. BBC Alba chose our match at Station Park against Hibernian and the coverage given was fantastic and a testament to the work BBC Alba put in. 352 – We broke our attendance record with 352 fans attending our aforementioned clash with Hibernian on BBC Alba. With the match being live on TV and on a Friday night clashing with Scotland vs Belgium, we were delighted to have so many at Station Park.